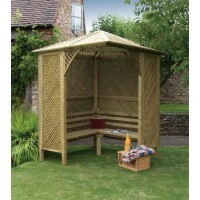 Create an oasis in your garden by installing either an arbour, arch, gazebo or pergola. There are a number of seated arbours which are perfect for that area in the garden where you can relax and enjoy a late summer evening, frame the entrance of your garden with one of our stylish arch's, or maybe you have more room to install a gazebo to entertain family and friends al fresco and the pergola's available will suit the smallest of gardens to the largest. All the our garden structures are made from planed timber which has been pressure treated to give protection against fungal and rot. They are delivered with assembly instructions and are easy to assemble.